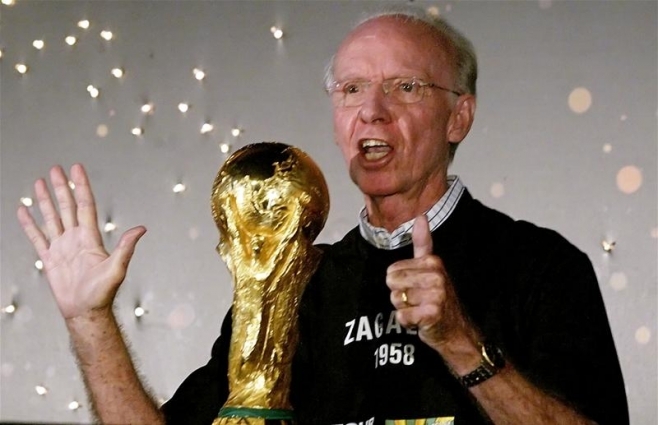 Last week Mario Zagallo celebrated his 80th birthday - a date that also serves as a celebration for Brazilian football. Over its history of more than a hundred years, Brazil have produced better players - and some would argue, better coaches as well. But there have been few figures as important as Zagallo, world champion as a player in 1958 and 62, as coach in 1970 and assistant coach in 1994. He went with Brazil to two other World Cups, both in Germany, and neither with a happy ending. He was in charge in 1974, and assistant to Carlos Alberto Parreira in 2006, both disappointing campaigns. It was a magnificent answer - I laugh thinking about it even now. It takes us straight to the soul of a man who, when he cuts himself, probably bleeds yellow and green. But there is much more to Zagallo than the zealot in the cause of his country’s football. His enthusiasm is a wonderful, contagious thing. More important than the enthusiasm, though, is the idea, the big concept that enabled Brazil to become the country which has won the World Cup more times than any other. That idea is the realisation of the importance of a balance between attack and defence - something Zagallo, as player and coach, symbolises better than anyone else. Attacking brilliance is something that Brazil have been able to count on ever since the game turned professional, opening up the chances of a career to those from all backgrounds. The 1950 team were among the most attractive ever to play in a World Cup, with superbly talented inside forwards Zizinho and Jair making the bullets for centre forward Ademir to fire. But they did not win the trophy because, come the vital hour, Uruguay found a hole in their defence. But if there is no hole, if the team do not concede a goal, then they get full value from their attacking ability - and this is the story of Brazil’s success. By 1958 Brazil had introduced the back four, with its key concept of defensive cover. An extra player had been withdrawn to the heart of the defence. But there were still two wingers, a central striker and a support striker. The big danger of the new 4-2-4 system was that the two in the middle might be swamped. Zagallo had turned himself into a left winger precisely because of his international ambitions. Brazil had plenty of superb options to fill the more glamorous attacking positions - at left wing there was less competition. Now he saw that he could be more useful to his team if he worked back to fill the hole in the midfield. When his team had the ball he was a left winger, carrying a threat to the opposing goal with his dribbles, crosses and shots. But when the opponents were in possession he was a midfielder, working back, helping out, trying to win the ball again. He was two players in one. Brazil won the 1958 World Cup without conceding a goal until the semi final. Four years later in Chile Zagallo’s defensive contribution was even more important, as left back Nilton Santos was now 37 and past his best. Eight years later, at short notice, Zagallo took charge of the team in the build up to Mexico ‘70. Many have tended to minimize his contribution, with the argument that he was lucky to inherit a ready made team constructed by his charismatic predecessor Joao Saldanha. It is not a chare that stands up, for all Saldanha’s virtues in shepherding the side successfully through the qualification campaign. His team, though, were still playing 4-2-4. Zagallo, aware that the game had moved on, was adamant that Brazil had no chance of winning in Mexico using this formation. He had to tighten things up. A few changes of personnel were made, but the most important switch was in tactical approach. Zagallo’s Brazil left only Tostao, improvised as centre forward, upfield. When the opposition were in possession, everyone else came behind the line of the ball. The 1970 team could be seen as pioneers of 4-5-1, or 4-2-3-1, labels he is happy to accept. Some of the greatness of that side comes from the fact that they were tactically ahead of their time, especially in terms of their balance between attack and defence. The importance of this lesson, and of Zagallo the player, was something England were quick to pick up on. Alf Ramsey’s side that won the World Cup in 1966 essentially counted on a Zagallo on either flank - Alan Ball on he right and Martin Peters on the left were a new kind of versatile player, able to carry out the functions of a winger, but also competent at working back to form part of the midfield block. Such poli-functionality was taken to greater heights by the Holland side of 1974 - a team of 11 men that seemed to work as one living, breathing unit, pressing together to win the ball, breaking forward together in search of the opposing goal - carried out with a concept of versatility that Zagallo had shown to the world. The fact that his 1974 team were so comprehensively beaten by the Dutch is one of the ironies that Mario Zagallo can look back on as he reflects on one of the most influential careers in the history of football.